Modified ACM is a framework created by Caronte Consulting and based on the mathematical tool Active Contours Without Edges proposed by Tony Chan and Luminita Vese. It is a useful tool in Computer Vision in delineating the contours of an object in an image, even in the presence of a loud noise. They are used successfully in the operations of object tracking, shape recognition, segmentation, edge detection and stereo matching. The Active Contour Model were introduced by Tony Chan and Luminita Vese1, are called snakes for the way they evolve, perfectly highlighting the outlines of one or more objects in highly noisy images. The method also enables the binarization of the images. The main element of the method is a curve C that “moves” in the image in such a way that the internal energy content Φ the curve may always increases (Φ > 0), while the external energy content of the curve always decreases (Φ < 0). 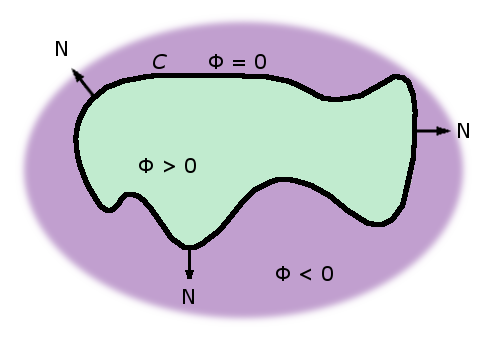 The energy content along the curve C, instead, is null (Φ = 0). The algorithm moves the curves in four directions so as to always maintain true these conditions. Operation is simple: we place a base random curve on the image (A), we evaluate the energy content in and out of the curve, you evolve along the curve all directions (B) and the energy content is evaluated for each position inside and outside: it occurs which position maximizes the internal energy content and minimizes the external one, choosing it as a new curve for the next iteration. If the solution is not stationary start over (C), with the new curve as the initial element, finally getting the edges of objects (D). This algorithm is highly immune to noise: even in the presence of highly noisy images is possible to identify the objects. The curves are able to locate items even if they have soft edges or low-contrast. The technique is valid for grayscale images or in the color space. The fitting function is changed depending on the results to be achieved. The algorithm is also applicable to detect three-dimensional (3D) objects. The algorithm of the Modified ACM allows you to customize the fitting function for pattern extraction from images and uses the concept of a multiphase, such as the evolution of more competitors curves between them. 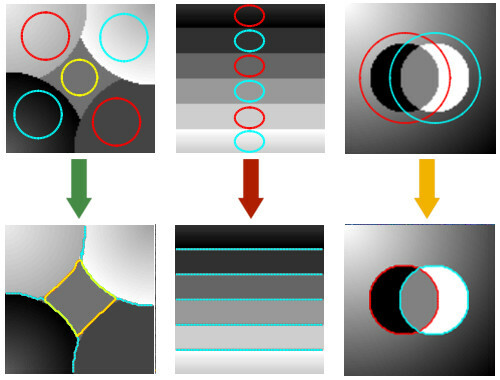 The multiphase variant allows to evolve more curves simultaneously, so that these are never to overlap and that each of which extract an object in its own right: the result will not be a simple binarization but a more complex image segmentation. The ACM can be applied in various contexts: medical, archaeological, agronomy, agribusiness, geological, industrial, etc. We can help you to realize the right Modified ACM for you needs: multiphase snake operating in the color space whose minimization function is customized to adhere to your problem by introducing an expert system in your GIS software, Matlab® , C / C ++, C#, etc. Tony F. Chan, Luminita A. Vese: Active Contours Without Edges, IEEE TRANSACTIONS ON IMAGE PROCESSING, VOL. 10, NO. 2, FEBRUARY 2001. Are you interested in this or other products? Each of our products is customized to the needs of each Customer, so the cost varies. If you want to have a precise idea on the expense that you can face, you can contact us by phone, by message, or come and visit us in person!